Rugby residents have formed a group to oppose a plan to build 130 homes which they said places Hillmorton under siege. The group, Hillmorton Under Siege, is opposing plans to build 130 homes on a patch of land near Kilsby Lane. Mrs O’Rourke is concerned on the impact the proposed development might have on school places for local children. She said she realised how stretched schools in the area are after her daughter initially failed to secure a place at Ashlawn School, despite their living a mile away. They appealed the decision and Mrs O’Rourke’s daughter was able to secure a place. 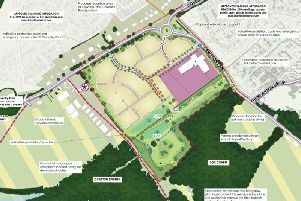 Mrs O’Rourke said residents are concerned about how much the proposed development will affect traffic on Kilsby Lane and Crick Road – which they said is already causing problems. Cllr Dahmash said: “The proposals for Kilsby Lane are yet another example of an unwanted and unsustainable speculative development in Hillmorton. “By coming together local residents in Hillmorton were recently able to fight off similarly unsuitable and unsustainable proposals for new housing developments on Barby Lane.